PhoneTorch provides functionality to use your Nokia 808 PureView (and other mobile phones) as a torch/flashlight. It supports both, the phone's LCD screenlight, and the phone's flash LEDs (video light) as light sources. 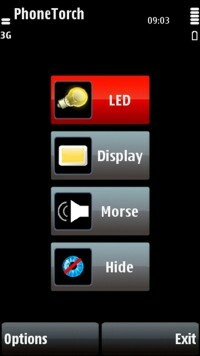 If you have an other phone than the Nokia 808 PureView click here for a version of PhoneTorch for your phone. Purchase and download PhoneTorch for Nokia 808 PureView here. If you have further questions, suggestions or other concerns regarding PhoneTorch, feel free to contact me by email under phonetorch<at>meh.at.